Want to help end homelessness in our community? We need all youth under 25 who might be experiencing homelessness to participate in the survey! This includes couchsurfing, temporarily staying with friends, and staying in shelters & safe houses. The Hub is hosting a Dinner & Movie Night on Thursday, April 5th from 4 - 7pm for anyone who wants to participate in the survey! Drop-in anytime between 4 - 7pm on by for a free hot meals, activities, free bus tickets, and lots of other free stuff! Can't make it tomorrow? Come by the Hub any weekday between Wednesday, April 4th and Thursday, April 12th to participate in the survey (and get free bus tickets!). 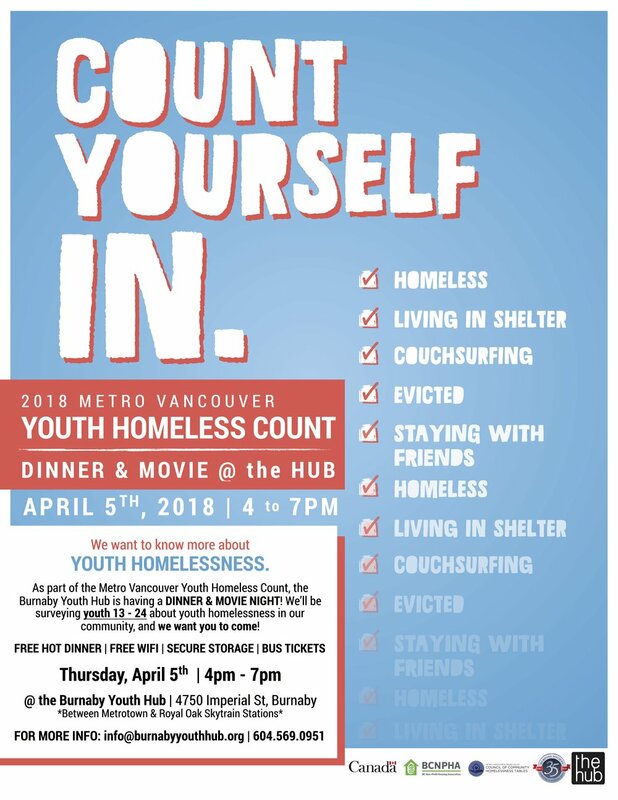 In participating in the Youth Homeless Count, you're helping to tell decision-makers what the problems are for youth facing homelessness in BC! Have questions? Email info@burnabyyouthhub.org or call 604.569.0951!